The dark corners of H Street Country Club last night shone with the brightness of DC’s vast blogging scene. 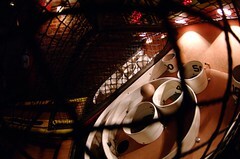 Representatives from a dozen DC blogs came out to play the mighty sport of knaves, skee ball. Wooden spheres flew mightily up the ramps and into the gaping maw of the waiting machine, ringing bells, flashing buzzers and all manner of sirens, while bloggers chatted, cheered and imbibed. The stakes were high: pride, glory and the love of the city. The event was thanks to The Hill is Home‘s Claudia Holwill, who felt that the only way to unite the city was through the power of skee ball. So, what followed? Camaraderie, inebriation and epic skee ball. Who came? Anacostia Now, New Columbia Heights, The Heights Life, The Totten Life, Greater Greater Washington, District Curmudgeon, Penn Quarter Living, The Triangle, Congress Heights on the Rise. It was a pretty packed house over at the Country Club. Six teams of eight emerged, and the rolling was fast and furious. Columbia Heights Has Balls faced off with The Totten Skeers in the finals, and it was an intense matchup. One roller from Totten managed a brilliant 61 that nearly put them into untouchable territory, but Columbia Heights brought their strong rollers to bear and it was within reach until the very last throw. Sadly, they couldn’t beat the Totten crew. Here’s hoping this becomes a more regular outing!